The avian iris is a ring-like structure that is thin at its borders, the ciliary border (margo ciliaris) and pupillary border (margo pupillaris), and is thickened in its midpoint. It is lined by a single non-pigmented epithelial layer at the anterior side and by a double layer of pigmented cells at the posterior side. 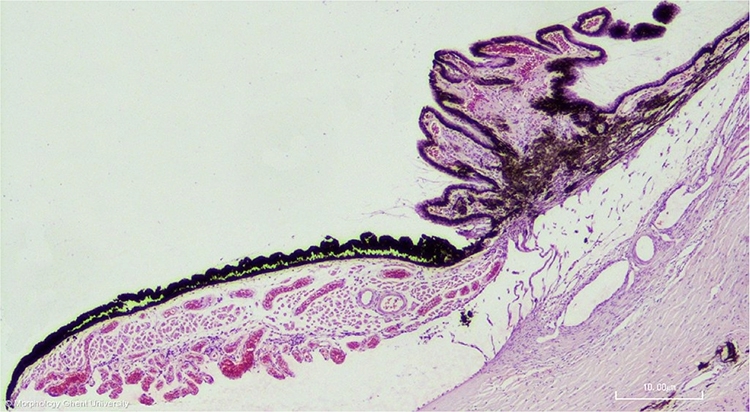 The stroma in between contains two layers of muscles, the sphincter muscle (m. sphincter pupillae) and dilatator muscle (m. dilatator pupillae). Both muscles are striated but in some avian species, also non-striated muscle fibers are present in the dilatator muscle. The iris gives the eye its color and controls the diameter and size of the pupillary opening.